The sky is the limit with the Playseat® Air Force! This chair is used by flight simulator enthusiasts and for training by professional pilots, who require the most realistic flying experience. This flight seat has an extra strong, lightweight, powder coated tubular steel frame with high-tension spring and wire system for the most intense flights. The high profile side bolsters are made of ultra high-density foam; fully upholstered synthetic leather, with reinforcements in the high wearing areas. Superior build quality, stability and comfort make sure you can enjoy this chair for many years. Thanks to unique foldable design, the Playseat® Air Force uses little space when not in use. To make your experience even more realistic, use Playseat® Air Force with a virtual reality headset, like Oculus Rift, PlayStation VR, HTC Vive or any other high quality VR set. It will enhance the realism of the flight or space sim you play tremendously, because you will be the pilot inside the craft, with an amazing view, no matter where you look. Playseat® is the essential accessory for the ultimate virtual reality experience! High quality seat, very comfortable. You can adjust the back to suit your needs and the seat fits perfectly with my flight stick. I sure do love this product. A+ and highly recommendable! Proper respect to the company making this product and doing so at such an affordable price! The best thing beyond the very good comfort level when you sit down - are the mounts for i.e. the Thrustmaster HOTAS Warthog. This is a must have! It makes the user experience flying so much easier. Using Oculus Rift and similar immersive experiences from time to time just emphasize that since you can easily feel your through the controls as they remain positioned just next to you. As I normally use a large display area i.e. triple screen or bigger in front of me (Oculus just too hard on the eyes for continuous use) I also have a touch screen in front of me i.e. using Win8, Win10 or beyond. I did an easy to do home cockpit mainly using inspiration from modern avionics following digitalization in modern cockpits. To "connect" the platform I did mounting touch screen in front and multiple displays I bought the mat accessory too to aesthetically bind the seat with what is in front of me. It looks better than having the sear standing there alone. You sit very comfortable and beyond my expectation for a "playable" seat like this. I normally sit working in a luxury HÅG office chair - and this seat is up to it! Very, very good. The features of the seat are very nice. I just got hold of some extra bolts to screw the HOTAS Warthog flight stick and thrust onto their mounts. Lots of possibilities to adjust stuff to fit your height etc. All in all a very well made high quality product for flight simmers both considering build quality, comfort, feature and flexibility. A product made be someone who made this for himself first I guess. No bad quality stuff. Really well made. If you buy into flight control systems like Thrustmaster HOTAS Warthog (it even comes with a mount included for a Yoke) ... you are already putting a bit of your pocket forward ... and you definitely need this to complete your experience. It will be so much better. Glad I did opt out of the office chair! Best decision ever! This is a solid chair of high quality. It is perfect for flight simulation, especially with of combination of a side stick and a tthrollte quadrant (e.g. for 2 engines). Its big advantage is the "dual function": It can be used as a (beautiful!) "office chair" for any computer / business work; and within one minute, it can be changed into a "cockpit seat", with a control stick at one side, and the throtlles as well as other functional switches of the airliner (or fighter jet) on the other side - using the same high performance computer; with 3 screen you have a real "captains feeling". I've had the seat for about a week now and spend quite a few hours in it both gaming and watching movies, working, etc. I absolutely love this thing. I got this seat over other flight sim cockpits because I wanted to use my current desk. I didn't want to give up my day to day computing activities/work station in place of a pure gaming center. My desk sits a little high, so the stock height of the chair was a tad low, not too bad though, about the same height as my computer desk at its lowest stage. That being said, I threw some caster wheels on the bottom of the chair and it sits at the perfect height for my desk now, and rolls great. Prior to the wheels I had set it on a pair of 2x4's and zip tied it, but its quite heavy and sliding it got old. I picked the wheels up for $4 a piece at home depot and simply zip tied them to the bottom brace of the chair, they work wonderfully. They stay in place perfectly and now I can roll the chair in and out of my desk with ease. The chair itself is really comfortable and has 4 different positions for lean on the backrest. I play with dual joysticks, so I don't use the middle pole, but I inserted it to test it out when I first got the chair and the fasteners/adjustments all work well and fit securely. The joystick mounts (side) are very adjustable for both height and horizontal distance from user. I've found the positioning very adequate in finding a comfortable position. I have only one very minor critique on the chair itself. The screws that hold the joystick/throttle mounts on the side are a couple threads too short in my opinion. Makes it easy to strip the last few threads on the screw because that's whats holding it in (only reason I'm knocking a star there). This can be remedied by simply using thinner washers instead of the thick plastic ones provided or getting longer screws (if you so choose to do so, its not necessary, just a precaution). Overall, I am really happy with my purchase and would recommend the chair to anyone looking for a sim chair/cockpit but wants to use their current desk or does not have the room for a full sim pit. Shipping was very fast (3 days from NL to Mid west US) Very happy customer. Thanks Playseat!! You won't find a better flight seat for the money. It is sturdy, versatile with plenty of room. It is so well suited you hardly notice it's there while you're battling it out. I would have preferred a mounting plate for the Thrustmaster Warthog that would allow the stick to be mounted on the middle arm. The supplied plate seemed to only work for side mounting. I made due by punching holes in the cover plate for the main middle plate, simple enough. The supplied plates, by the way, are awesome. Every inch of this equipment is tough and made to last. I looked into many other chairs and cockpits before deciding on the Playseat Air Force. I needed a chair that could replace my work/desk chair (I work as a Computer Engineer from home) and be a good chair for use with space/flight/racing simulators. Specifically I wanted a chair that could be used to mount controls on both sides (HOTAS) and a center mount for a yoke/stick/wheel. That is a lot to ask for. In the end, because of the versatility I needed, I opted for the Playseat Air Force which would do everything I needed and was quite a bit less than 1/3 the price of the competition (when including shipping costs). Assembly was very easy. The chair is comfortable even for sitting in it for 8 hours straight. The side mounts are adjustable (and easily-removed) and it can be used with pretty much any desk. Overall, I am very pleased with my purchase and I would recommend to anybody over its competition. Pros: Price compared to competition. High quality and comfortable even for long use. One of the most versatile cockpit chairs. Can be used as a desk chair. Very small footprint. Cons: It would be nice if it could recline further. down when mounting a center flight stick. I am a retired helicopter pilot and after many years doing the job I realized it's very unlikely I will ever touch the controls of a helicopter again. That's quite saddening. With technology available today I can still enjoy a variation of flying again. I purchased Microsoft Flight Simulator and an Oculus Rift to make the experience more realistic. All was fine except sitting in one of our conventional household chairs while using the simulator. After several minutes the sitting position became quite uncomfortable. I ordered an Air Force playseat from The Playseat Store and I've used it for about 5 days now. The Playseat is very comfortable. It's well constructed and high quality. The adjustments make using it so nice it puts a smile on my face. I'm probably not a typical age Playseat customer at 60 years old so if the seat is cushy comfortable for me imagine how someone younger might feel. Thanks Playseat Store for this fabulous product. Bought this to use with my Warthog + Rift for Elite: Dangerous, and for the most part it delivers perfectly. Well constructed overall, definitely solid, and perfect height to balance with my rudder pedals. 1: The side mounts for the stick and throttle are a bit of a pain, short nuts that screw through a bar that slides through a notch on the chair. back it out too far and they'll separate, Don't back it out enough, it won't go in. The distance between the two is something like a quarter turn, so there's that. 3: Right side stick mount is NOT HIGH ENOUGH. It's 1/4-1/2" too low for me, and maybe just a HAIR too far to the right. This causes some comfort issues for me in the RH side mid back and in the lower part of the forearm/wrist. I suspect I can source some longer screws/bolts and just elevate the stick another half inch, but for the price I shouldn't have to. Also, no bolts for the throttle [I get not everyone has a HOTAS warthog, but STILL: you include the plate, include some bolts.... velcro is a cheap solution in an expensive product. Usage: Minus the minor and DIY resolvable nitpicks, this gives Elite: Dangerous a level of realism I hadn't expected of a simple chair. Before I knew I was "flying my own ship", but now, with everything placed almost identically to the controls in the cockpit, It really adds to the FEEL of the game: as in now I really do FEEL like I'm in my ship. Once I get the stick adjusted to my liking I'm probably going to be killed by my wife for living in VR again. . and I'm okay with that :) WHAT A WAY TO GO! I have had my HOTAS setup on my desk for a few years now and my arms would get weary after a few hours of game play. I finally decided to spend some money on the Playseat Air Force to improve my gaming experience. 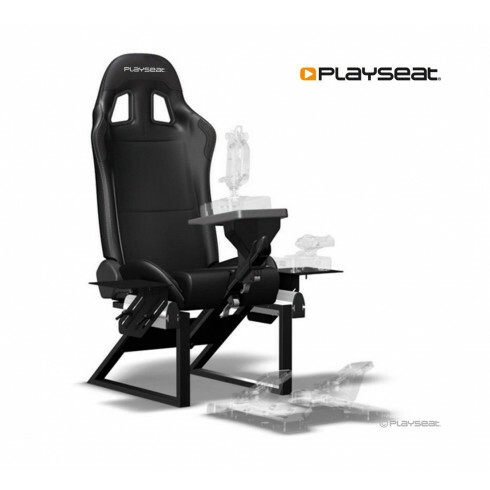 The Playseat Air Force gives the user some very nice configurations to choose from. You can have the Joystick centered or to the right, has a reclining seat although limited, and the ability to attach steering wheels. I have found that the side platforms have matching bolt patterns for my X-55 Rhino HOTAS, kudos to that. I do have some minor complaints in that I wish the side platforms were height adjustable by just a tad bit more. The other thing is flexibility, as adding a buttkicker required me to drill holes on the flat plate for my particular configuration (hardly any rattle I might add). These however are minor inconveniences, my biggest gripe is that there is no way to have a pedal mount attached to this chair without modification, flying sim users tend to use rudder pedals and this should have been an option. All in all I am very satisfied with the chair as I can use it as a regular desk chair as well, 4/5 stars! If you are looking for a gaming seat to use with flight games/sims and race games/sims, this is the one! You can easily set it up for both flying and racing: hotas joystick and throttle on the side mounted trays and racing wheel on the center tray, pedals on the floor(can also be used as rudder). The quality of this chair is very good and assembly a walk in the park. In my opinion the price is a bit too high and I wish the side mounts could go higher but all in all this is a great product I would recommend to everyone. I’ve been using flight simulators for a few years now and after all the regular gear, like extra screens, joystick, etc. I really wanted a proper chair to finish my “cockpit”. The Playseat® air force is really what I was looking for. It is strong and provides enough space to put joysticks and other gear. Incredible flight seat! Very comfortable and enough room for joystick, throttle and paddles. I really enjoy flying in this seat. It completes the experience and I think every flight sim fan should have one.